As usual in the business sector, 3 days before Simona’s arrival my schedule had changed completely! And instead of a relatively peaceful day, the day of Leaders-for-a-Day became very hectic! I guess that for Simona it was a great opportunity to see firsthand how it looks when you have to lead the team and run from one meeting to another - under the rain, without having time for lunch. Thankfully, Simona was cool and patient – a quality that I should learn from her. And not only that – It was revealing for me and my team to find out that she is only 17 and already knows exactly what she wants, in addition to being really well self-organized charming young lady. 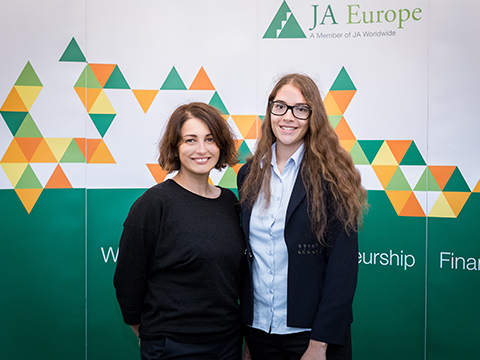 That day I went home with the thought that I am very grateful to JA, because the day with Simona helped me to suddenly understand that indeed a totally new generation will join our teams very soon, the generation that we will yet have to discover.